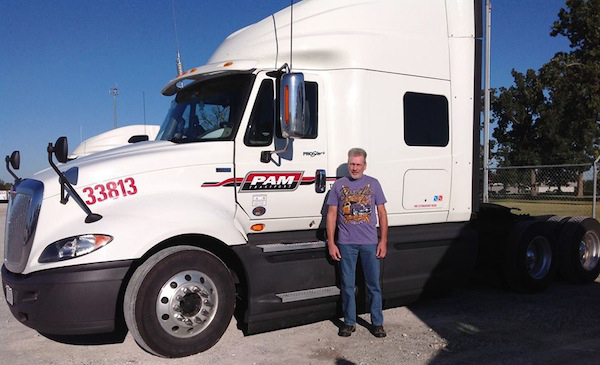 "Lonnie Jones has been a Professional PAM Transport driver for 6 years. He recently witnessed a motor vehicle accident and stopped to save a life. He saw a car swerve off the road in front of him and then went straight into some trees. He safely pulled over, immediately called 911, and ran down to the scene to see how he could help. At this point the vehicle had caught on fire; Lonnie knew not to move the person because it could possibly cause more injury. He quickly ran back to his truck, grabbed a fire extinguisher, and began to put out the flames. The fire extinguisher was soon empty, he ran back up to the road, and waved for some more help. Two fellow truckers pulled over to assist with their full extinguisher. The fire went out and the helicopter came to transport the individual to a local hospital. This great deed deserves great recognition! Lonnie, you are a big hearted hero!" Stories like this one go untold all too often and we want to change that! Many times when it comes to accidents on the road involving truck drivers and passenger vehicles, the media is quick to place the blame on the truck driver (though in most cases he/she is not at fault). Well, we know every day, week and month truck drivers all over the country are stopping to help others in need. Stories like these need to be told as well! Thank you to Lonnie Jones and all of the other professional drivers out there who stop in a time of need! You're all Highway Heroes!